This week I just got one book that I ordered shortly after finishing the previous book in the series. This is the fourth and final book in the Seven Realms series (young adult fantasy). 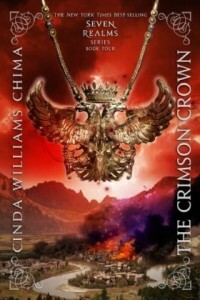 An excerpt from The Crimson Crown is available on the author’s website. I just finished The Gray Wolf Throne and loved it, mainly because of the two main characters. I need to know what happens to Han and Raisa! There are some spoilers for the previous three books in the description below. A thousand years ago, two young lovers were betrayed–Alger Waterlow to his death, and Hanalea, Queen of the Fells, to a life without love. Now, once again, the Queendom of the Fells seems likely to shatter apart. For young queen Raisa “ana'”Marianna, maintaining peace even within her own castle walls is nearly impossible; tension between wizards and Clan has reached a fevered pitch. With surrounding kingdoms seeking to prey on the Fells’ inner turmoil, Raisa’s best hope is to unite her people against a common enemy. But that enemy might be the person with whom she’s falling in love. Have you read any of the books in this series? If so, what did you think?